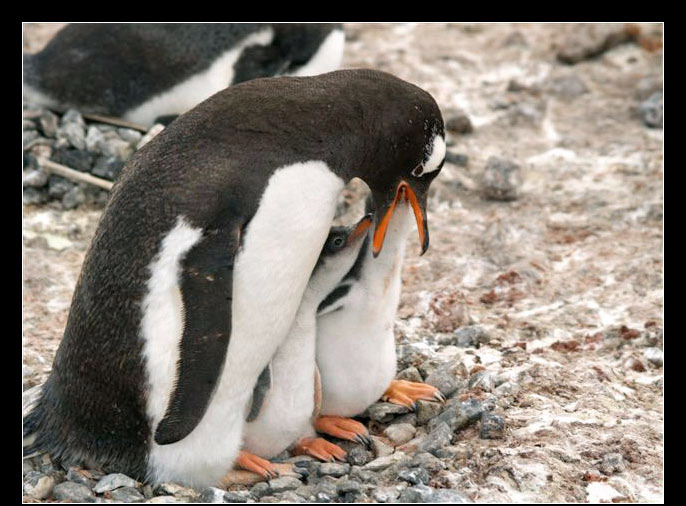 The behaviour between parents and chicks and vice versa. 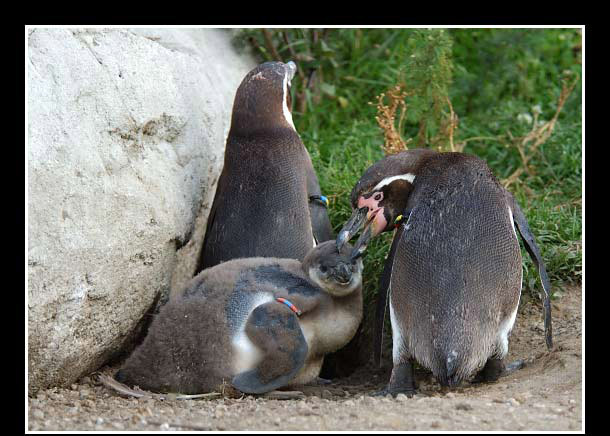 Also see breeding - chicks, while that behaviour occurs there too. 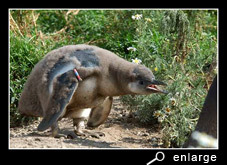 It is only seen during the breeding season. Hatching out eggs on the nest. 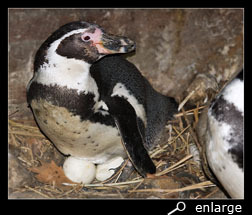 Typical pose is the bending forward, with the eggs lying between the feet and kept warm against or under the belly. 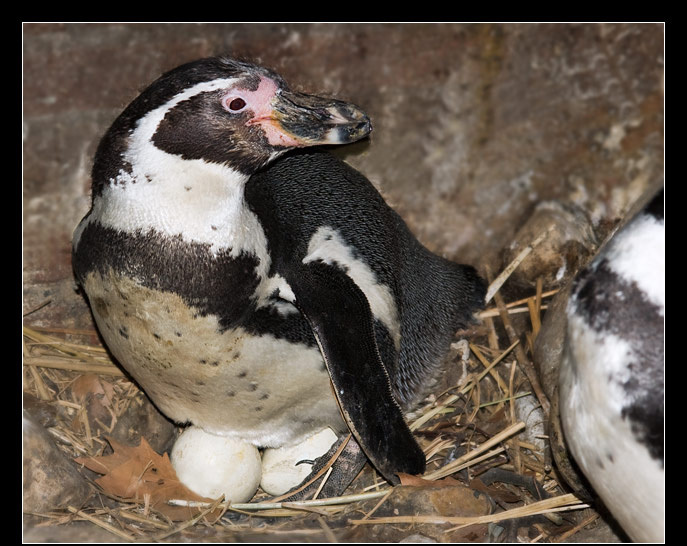 Frequently the parent bird will turn the egg(s) with his/her bill or flippers, so all sides will warm equally. 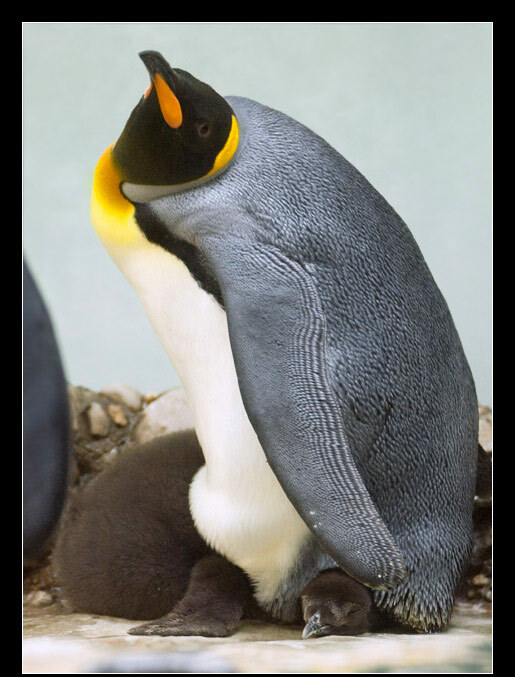 Emperor and king penguins hold their single egg on the feet and it will be kept warm against a bare brood patch, underneath a fold of abdominal skin. During the first weeks the chick too will be guarded and kept warm under the belly on the same place as the egg(s). As long as the chick is not able to regulate its temperature itself it will stay there. Afterwards the chicks of most species will gather together in small or larger crèches. 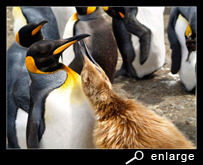 The staring pose of the king penguin on the picture is a threat and a warning for neighbouring birds to stay away. Such staring is also part of the aggressive behaviour. The chick shall tap against the bill of the parent bird and cheep for food. This tapping stimulates the parent bird to regurgitate a partly digested (fish) porridge. 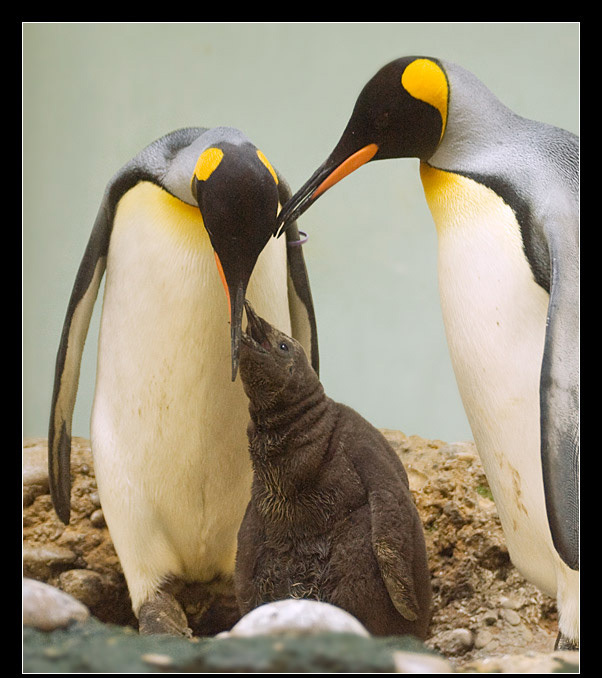 The chick holds its open bill in the beak of the parent, which drop the porridge directly in it. 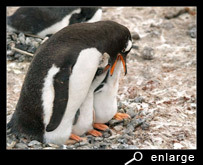 The mutual preening, part of the sexual behaviour, can also be observed between parent and chicks. 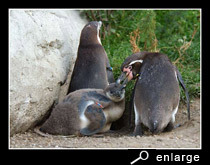 On the picture on the right you see a humboldt penguin preening the down and feathers of its chick. Before fledging the chick has to moult to its juvenile plumage. This plumage differs from the adult plumage in one way or the other. 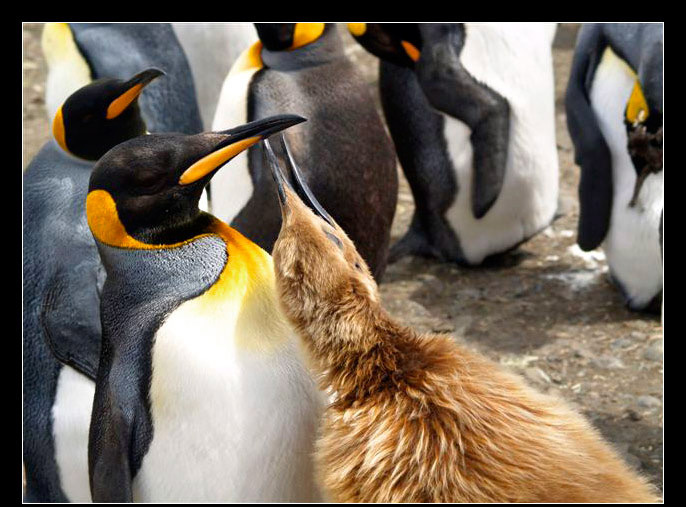 For emperor and king penguins the yellow or orange patch is not very pronounced. Spheniscus species don't have their black band and the pattern of the black spots on their belly is still missing. 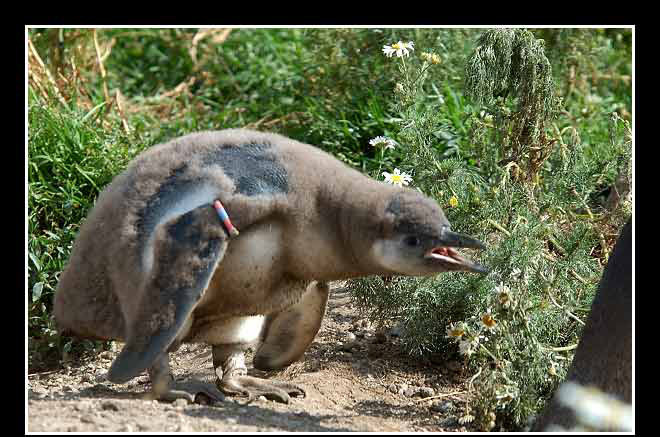 Juvenile crested penguins lack the crest and the white ring around an adélie penguin eye is barely visible.